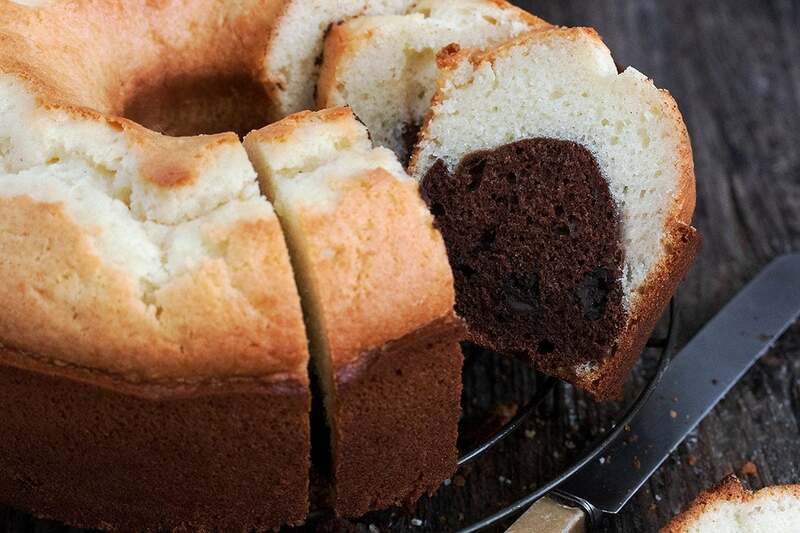 This vanilla chocolate pound cake is called Tunnel of Fudge Pound Cake, owing to the wonderful tunnel of chocolate that runs through the middle of the cake. This Tunnel of Fudge Pound Cake is a long-time favourite, that combines the best of both worlds. You don’t have to decide if you want vanilla or chocolate. 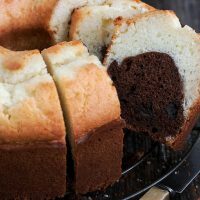 This vanilla chocolate pound cake has them both! Not only is the Tunnel of Fudge delicious chocolate pound cake, it has lovely pools of chocolate, owing to the chopped chocolate that is added to the batter! This is a great cake to combine with Summer’s fresh fruits on a plate, for a great Summer dessert. Or simply enjoy eating this one out of hand. If you don’t have a tube pan, you can bake this one in a bundt pan. If you go that route, you will flip your cake over at the end (which you don’t do with the tube pan). It’s a bit of strange shape, as the bottom won’t be flat, but obviously still delicious and pretty. 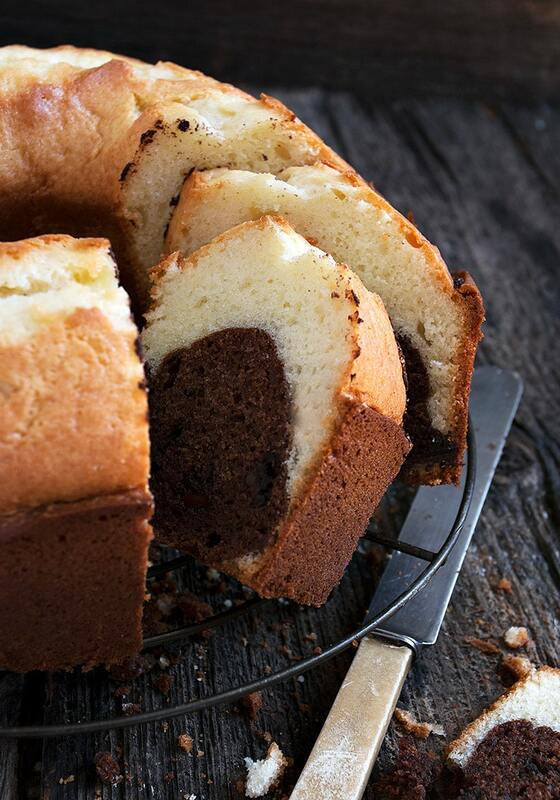 You’ll notice that this pound cake uses oil instead of butter. Using oil makes for a light, moist cake, with little difference in flavour. If you’d prefer to use butter, go ahead and use melted (and cooled) butter. You’ll need to use a bit more than the amount specified for the oil. Use about 1 cup + 3 Tbsp melted butter. Keep in mind that the cake will not stay moist as long if you use butter, so plan on eating it up right away or freezing while still fresh. Speaking of freezing, yes, this cake freezes beautifully. I like to cut thick slices and freeze, then you can grab a slice or two as needed from the freezer. 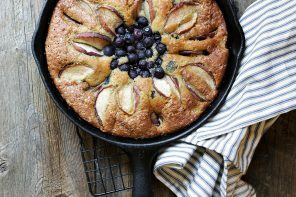 This is a great cake to slice and serve on a plate with fresh fruit and a scoop of ice cream or a dollop of whipped cream! 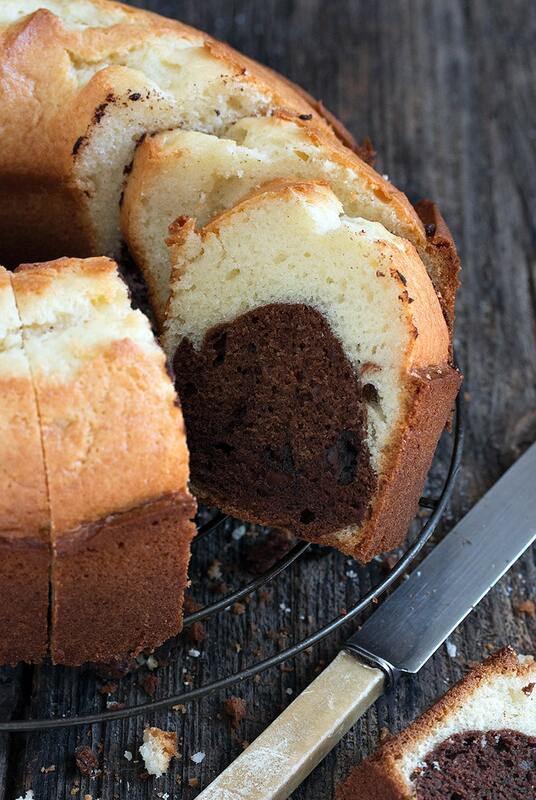 A vintage recipe for a pretty pound cake, with a tunnel of chocolate running through the middle. The chunks of chocolate make lovely little pools of chocolate flavour. 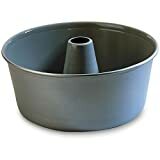 You'll need a 10-inch tube (angel food) cake pan or alternately, you can make this in a similar sized bundt pan. 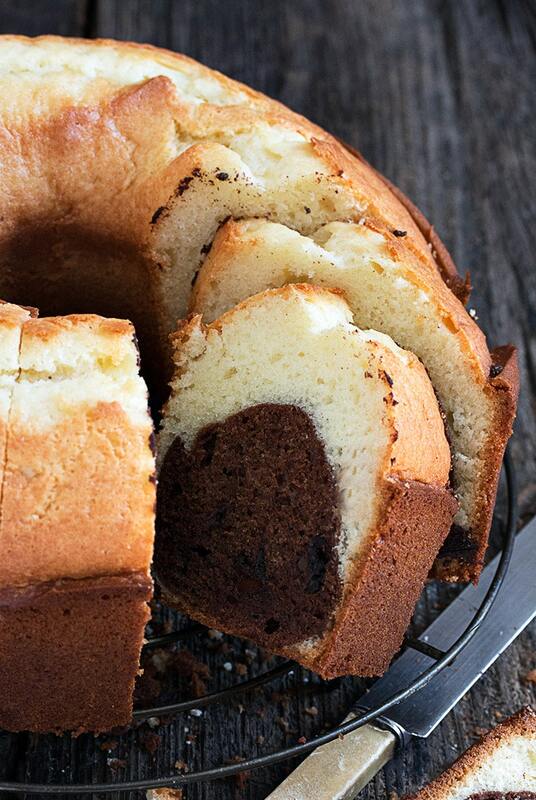 Simply flip your cake over at the end if you go the bundt route. Preheat your oven to 350F. Grease a 10-inch tube (angel food) cake pan and set aside. Whisk together the flour, baking powder and salt in a medium bowl. Set aside. In a large bowl with an electric mixer or the bowl of a stand mixer fitted with a paddle attachment, beat together the sugar and oil. Add the eggs, one at a time, beating well after each addition. Scrape down the sides of the bowl as needed. Stir in the vanilla until blended. Add the flour mixer alternately with the milk, mixing just until combined. Measure out 2 cups of the batter and add to a medium bowl. Stir in the melted chocolate and the chopped chocolate until well combined. Spoon 1/2 of the plain batter to your prepared pan, covering the bottom of the pan. Spoon the chocolate batter in a ring on top, keeping it in the centre and leaving the inner and outer edges clear. Top with the remaining plain batter. Bake in preheated oven for 50-55 minutes, or until a tester inserted in the centre comes out clean. 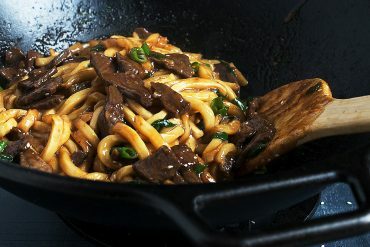 Cool in pan for 15 minutes, then run a knife around the outside and the inner ring. 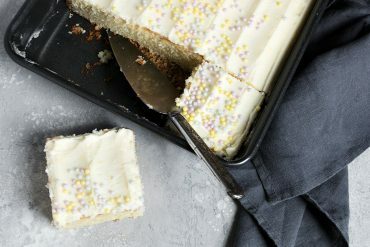 Remove cake to a cooling rack to cool completely. This pound cake is best made in a tube pan, aka angel food cake pan. These pans have a removable inner piece with a cone in the middle. This allows you to lift the cake out of the pan easily. Here are several options if you’d like to add one to your kitchen. This sounds wonderful and is a cake that was my favorite as a child. I tried to make this cake yesterday from my Mom’s recipe which is difference and it was a disaster. I am going to try your recipe but I am wondering if you could use mini chocolate chips for the semi sweet chocolate? If so, would you leave them whole. Is there a reason this chocolate isn’t melted? Does it melt while baking or leave whole pieces of chocolate in the cake. Thanks so much! Save me a slice Jennifer! This looks like one cake that would disappear quickly at our house!! I love that tunnel of chocolate, such a delicious cake! Wow Jennifer … this is one gorgeous cake! I love that you get the best of both worlds in one bite – outstanding! Saw this cake (before breakfast!) and just finished making it. Thought you’d want to know … you have the vanilla listed in the ingredients, but not when to add it to the batter. It’s still cooling, but smells delish! 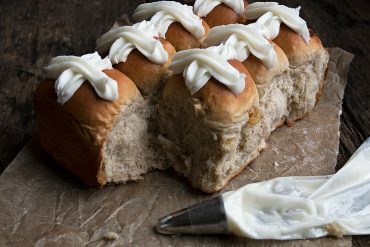 Such a fun pound cake! 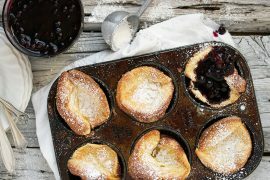 You know how to start off the weekend – this is a great breakfast option, especially if piled up with fresh fruit as you suggest. My mom used to make this cake back in the 1960s. Seeing your picture of the cake brought back wonderful memories watching her make this cake from scratch without a recipe. Occasionally she would dust the cake the top of the cake with powdered sugar. 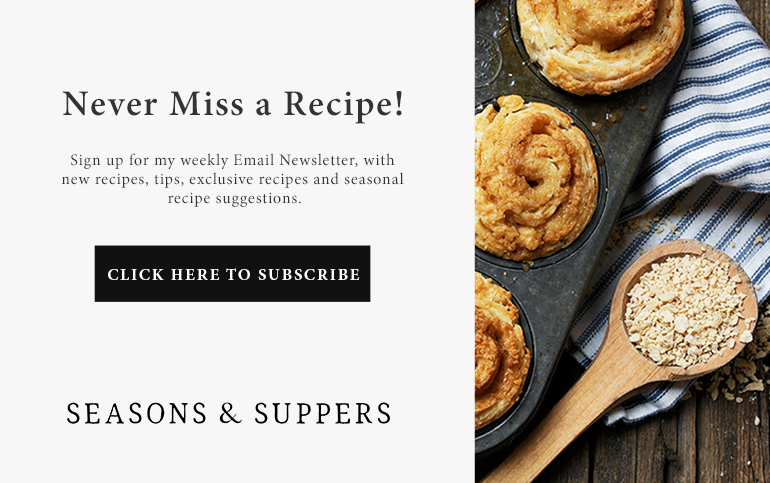 I’m so excited to try your recipe! This made me smile because it was my mother’s favorite cake, she used to make it from a mix, and when they discontinued it she literally stockpiled them, we ate a lot of it growing up, and I never thought about making it from scratch, can’t wait! Oh my gosh – my mom used to make this from a mix, too! And it was our favorite, when she did!! That was my first thought when I saw the title! :) Beautiful cake, Jennifer!! 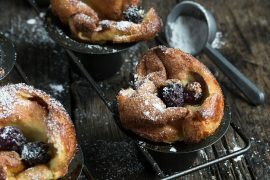 Could 1/2 cup oil and 1/2 cup melted butter work? 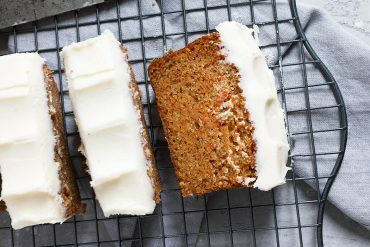 As a fellow Canadian I wave a big Alllo flag and thank you for sharing your delicious recipes and drool-worthy pictures! The pound cake is in the oven and smelling great! I’m reading over the recipe list and I’m seeing the vanilla but its not in the steps/directions though. And of course I didn’t do a mise en place but followed the directions step by step hence I didn’t add the vanilla… d’ooooh! 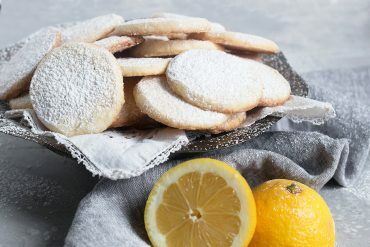 So I had 10 mins baking time left ran to oven and sprinkled some vanilla sugar I had … will let you know how it turns out when cooled and sliced and scoofed. Sorry about that. Off to fix it that right now! Thanks! It was delicious none the less but will try again with the vanilla for comparison.